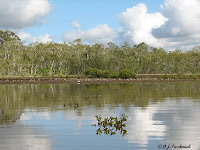 I did a count of the south Crab Creek area this morning for the Queensland Wader Studies Group. I counted over 300 birds before an osprey overhead disturbed all the roosting birds. A couple of years ago we did count over a thousand birds on this site but that was a little later in the season. Here's a photo of part of the flock of Bar-tailed Godwits. As well as the Godwits I saw Eastern Curlew, Whimbrels, Common Greenshank, Grey-tailed Tattler, Pacific Golden Plover, Red-capped Plover, Little Egrets, and Pied Oystercatchers. After the roosting flocks were disturbed by the osprey they settled down again in smaller groups among the mangroves and I was able to get quite close without disturbing them. 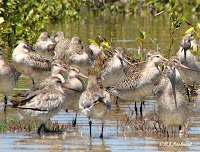 Bar-tailed Godwits – there is one juvenile just to the right of center. Numbers of Whimbrel had been roosting with the main flock of Godwits and Eastern Curlew but I did find some roosting in mangroves and managed to get this photo although the lighting is not good. I stepped out on one of the sandbanks to do a closer count of some Red-capped Plovers and Pacific Golden Plovers but then saw there was a very agitated pair of Pied Oystercatchers there as well. When they saw the direction I was walking they flew close overhead almost as if they would dive at me. I backed off and when I was well back in among the mangroves they finally quietened down and then went back to close to where I had first seen them. This behavior seems to be consistent with birds protecting a nest so I hope to get back there in a week or so to try to see them again and see if they have young. I hope that the eggs are close to hatching because the place where the birds were standing this morning will go underwater in the big tides next month. 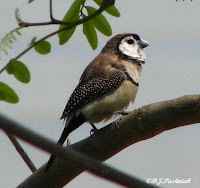 Visit the Bird Photography Weekly for more bird photos. 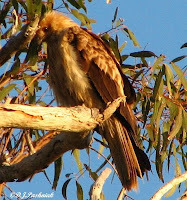 Whistling Kites are quite common around the bay. However, I usually see them soaring overhead and have learnt the shape of their silhouette and listen for their distinctive whistling cry. 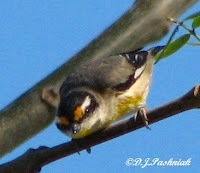 I have only once – in five years - seen one perching close in a tree and that time I was too slow to get photos. The other morning on a walk down at the Mullen's Picnic area I was in the right place at the right time. A Kite flew down onto the branch of a tree and sat for just long enough for me to get a couple of photos. Slater's Field Guide describes them as “dingy-looking” but this one is definitely not. Certainly flying overhead they do not show the distinctive markings and colorings of some of the other raptors but up close like this and with the morning sun shining on it the colors are beautiful. 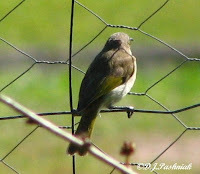 This morning I have had numbers of Brown Honeyeaters visiting my garden. Up until now I have only seen single birds that didn't stay for more than a few minutes. We had a big storm late yesterday with some hail and very heavy rain and this morning everything is fresh and damp. Maybe this had something to do with the birds checking out all the flowers. So I have spent some time chasing some decent photos. 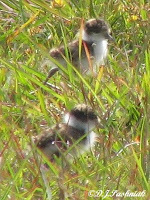 These birds are so tiny and so very fast – and my camera is so slow to focus. This is a good clear photo but the back view doesn't show much detail! This one would be great but why have the head buried in the flower? Finally a clear one although against the light. My Christmas wish list includes a new camera and lens! One can always dream! 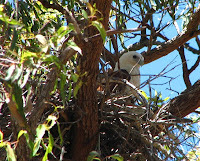 Its been a busy week and all I've had time for is one quick visit down to the Mullen's Creek picnic area to check on a Brahminy Kite nest. 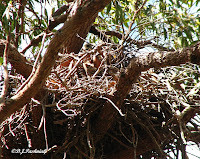 This nest is immense and I am told it has been used for many years - certainly longer than the 5 years I have been here. Over the last few weeks I have been trying to see if the birds were nesting there again. The best I could do was this photo - taken nearly two weeks ago - with what looked like a white head just visible. Yesterday I saw a bit of white above the side of the nest and when I went around to the other side I saw this bird. The nest is so high in the trees that it is impossible to see anything inside it and the best one can hope for is to see a bird fly out. Last year I was lucky enough to see a young bird fly from the nest. It was fully fledged but did not yet have full adult coloring. 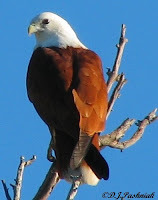 I see Brahminy Kites quite frequently when I am walking or kayaking around the bay. I photographed this one in April sitting on a dead tree overlooking the water. 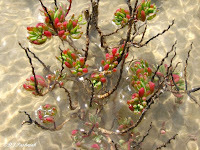 I had an interesting walk out at Inskip Point yesterday afternoon. The tide was higher than I had expected it to be so the only birds I saw were right up on the point where all the traffic goes. It always surprises me how many birds use the area despite the number of vehicles and people all around them. The first waders I saw were Red-capped Plovers and Red-necked Stint busily hunting for food in an area of very soft sand. These are the Red-necked Stint. There was one Eastern Curlew which definitely didn't want me to come any closer. There was a juvenile Crested Tern that really didn't know what it should and should not be eating. This fish is poisonous and if it had managed to swallow it the result would be disastrous. Then I spotted a single Whimbrel and tried to get closer to get a good photo but it was even more timid than the Eastern Curlew. While I was slowly trying to get closer another bird flew in and landed close by. This was a juvenile Bar-tailed Godwit – the first I have seen this season. They leave the arctic some weeks after the adults have left. 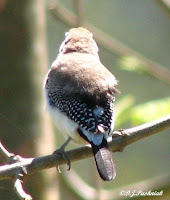 The plumage of the juveniles has quite a different pattern. They only keep this plumage for a few months after they reach here and then molt into the typical adult patterns. I will include a photo of an adult for comparison taken a few weeks ago. 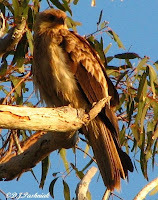 The best sighting of the afternoon was when I was walking back to the car park along the bush track from the point. Unfortunately my attention was in the tree-tops where I could hear birds. I heard a rustle in the grass very close to my feet and was just in time to see Black-breasted Button-quail scurry into the longer grass. I was too slow getting the camera up to take any photos but it certainly made a nice end to the afternoon walk. 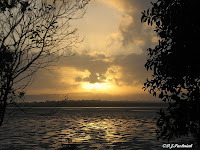 I am posting just one photo for Skywatch Friday this week. 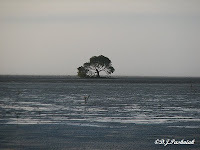 This is the same tree - a mangrove - that I photographed in the mist for last week. 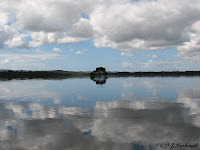 A high tide and a beautiful sky make a big difference! Kayaking has been nearly perfect over the last two days. The weather has been great. The high tide has been early before the wind gets up. Real perfection would have been a bit more water at the top of the tide. This end of the bay is so very shallow that without a lot of water it is just not possible to get really close to the birds at the edge of the bay. The Crab Creek area. Mangroves line the creek and there are almost hidden channels that lead back behind the mangroves into very shallow open water. The Mullens area. This is a large open bay with very shallow water. At low tide it is dry from one side to the other. This morning the water was no more than knee deep in most places. Both these areas are important high tide roosts for the shorebirds. This morning I saw Bar-tailed Godwits, Eastern Curlews, Whimbrels, Great Knots, Common Greenshanks, Lesser Sand Plovers, Red-necked Stints, Grey-tailed Tattlers, Terek Sandpipers, Pied Oystercatchers, Red-capped Plovers, and Gull-billed Terns. 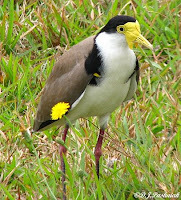 Masked Lapwings (Vanellus miles) are one of the most spectacularly colored birds in this area – but I do not like them! How can you like a bird that lives in an urban area and then tries to drive out the humans from the area. 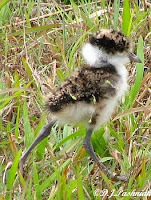 For most of the year I can live quite peacefully with Masked Lapwings – or plovers as we used to call them. Even when they start nesting it is possible to walk right by as long as you don't get too close. However, when the chicks hatch the problems start. Wherever they want to walk – they walk! The parent birds simply clear the way for them and beware any human who gets anywhere near. Even carrying an open umbrella in the middle of a sunny day – and looking quite stupid of course! - is not enough to keep the birds from swooping uncomfortably close. So I end up finding somewhere else to walk – and the birds win! This year they have been nesting since early July and I saw young birds walking around back then. Right now there are chicks and parents on both sides of me. My yard is totally fenced so the birds come quite close on the other side of the fence. The other day I heard them coming closer and closer so went out with my camera and a step stool which would let me see above the fence to take photos. 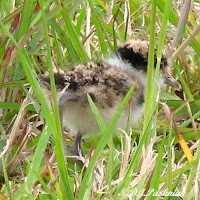 The parents screamed and swooped as soon as they saw me and I got one glimpse of a chick – then nothing moved! I had seen two chicks from a distance the previous day so decided to wait. It took about 10 minutes. I stayed still and eventually the screaming and yelling died down to agitated squawks. Finally there was a shrill piping sound from in front of me and the first chick came out of the grass and ran towards the parent bird. Then I heard another little piping sound from about 15 metres to the right and another chick appeared. Finally a third one from about the same distance to the left. I took my photos and left. The next day I heard them from about the same area so obviously they hadn't been too worried to have me around. Occasionally we get a fog down on the bay. The far side of the bay disappears and even familiar objects look different. The sun coming up quickly disperses the fog but for a few minutes even the puddles on the sand flats are touched with pink and gold and the far channel has a little silver bridge crossing it. This post is for Skywatch Friday. Follow the link to see others. I went to visit relatives in Esk the other day and spent quite a bit of time running out to the backyard as I heard different bird calls. It is a totally different environment from where I live and a chance to see some different birds. The garden was full of flowers and the air was heavily perfumed. Very beautiful! 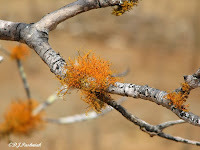 The big silky oak tree next door was coming into flower – a very beautiful sight. Most of the flowers were still up high so it was hard to see any but the larger birds. 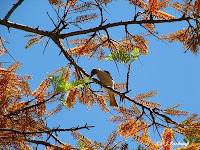 I saw Rainbow Lorikeets, Noisy Friarbirds, and – very briefly – Brown Honeyeaters. There was another tree next door which was still getting its leaves and it made it easy to see the small birds. 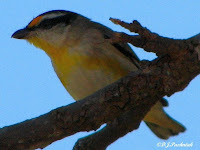 The Striated Pardalotes were there again. (See my post of July 2) They are such inquisitive little birds. 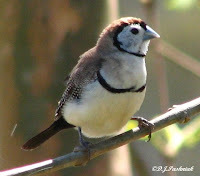 The best sighting for the day was the Double-barred Finch. Previously I had only had brief views of this bird and no photos. 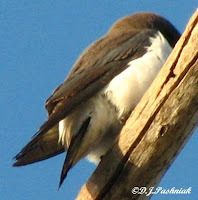 I am posting a photo of a Dusky Woodswallow I took a few weeks ago. I know its not a great photo but I was lucky to get one at all – and there's a story behind the photo. Whenever I walk in the bush I have my dog Misty with me. 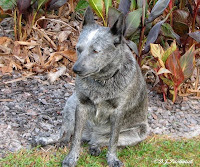 She's a little 'Smithfield' or 'Stumpy-tailed Blue Cattle Dog'. Her senses are all much sharper than mine and I trust her instincts in the bush. She's five years old and I have had her since she was a little pup. She has always been made to drop back behind me when I see a bird to photograph and she must not move or make a noise. As to the noise bit – I have never known her to bark outside my yard but inside the yard she is noisy and very territorial. This day I was out photographing wildflowers and was only looking for them. She was ahead of me as usual but then dropped back in behind me. I was still looking for flowers and took no notice so she came close to me and started nudging my leg with her nose. Then I saw what she had seen and I hadn't even noticed. In the trees just ahead there was a group of birds. I am sure she thought I was a bit slow at getting the camera out and taking photos. I was on an early morning walk along the bayside when this White-breasted Woodswallow (Artamus leucorhynchus) obligingly posed on the branch of a dead tree. At this hour of the morning the sky seems such an intense blue but without the glare of later in the day. I frequently see these birds in this area although they don't always sit where I can get photos. Have a look at the Bird Photography Weekly site. Sarah called it “an adventure” but that was after listening to me saying it was too much like “hard work” and definitely a “mistake” to listen to the weather forecast! We had just returned from kayaking around to the Smoogers Point bird roost. It was warm and sunny and the water was great but the wind kept on picking up and we ended up by paddling back approximately 3 kms into what the report had said would be “light to moderate” winds. Well “light” they were not! And if they were “moderate” then it was on the upper end of the scale! My shoulder and upper arm muscles are sore this morning to remind me. Added to all this was the frustration of seeing the birds fly before we had a full count. We saw numbers of Bar-tailed Godwits, Whimbrels, Grey-tailed Tattler, Eastern Curlew and a few Common Greenshank. So the only bird photo I have to show for the morning was a little Red-capped Plover among the saltmarsh plants and mangroves at the edge of the water. 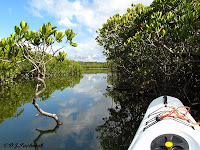 Paddling back to Carlo Creek where we left our cars is this great view up the Great Sandy Straits toward Inskip Point. 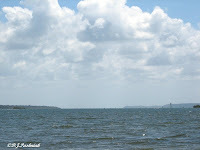 Fraser Island is in the distance on the right of the photo. 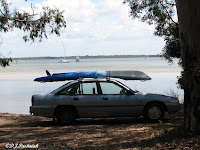 Carlo Creek camping area looking towards Tin Can Bay with the kayak up on the car ready to go home.